Fertrell Rose Food, 4-2-4, 50 lb. This one's a favorite with American rose growers that want performance without the use of chemical fertilzers. The multipurpose plant food contains readily-available nutrients to give new roses a jumpstart, while time-released nutrients feed the plant through the rest of its growing cycle. customer reviews rate this blend very highly! Product Code: Rose Food 4-2-4, 50 lb. SKU: Rose Food 4-2-4, 50 lb. Made by hand in house. 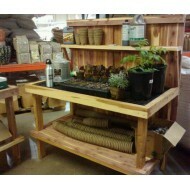 This potting table made of eastern cedar is functional in addition to being attractive. Long lasting, durable potti..
Fertrell Liquid Kelp, 1 gal. Fertrell's liquid kelp contains a broad range of essential microelements, growth plant hormones, vitamins, enzymes and carbohydrates. This biostimulan..